My grandparents, my father, and two older brothers attended the one-room West Head School. When it was my turn to start school in 1962, the school was no longer in operation. I rode the bus to the brand new K-6 elementary school just a few miles away in Osborne. I loved school so much that I wanted to attend seven days a week. When I reached Mrs. Garnet Williams’ Grade four class, I realized I could not see as well as other students. Unfortunately, the teacher did not notice. Each day, Mrs. Williams would choose a student to copy afternoon lessons on the chalkboard. When my turn came, I printed letters and numbers that were about a foot tall, and nobody questioned why. The truth was, I desperately needed glasses. Then I moved on to Grade five with Miss Ann Giffin. She was a no-nonsense disciplinarian who meant business. The strap that sat in plain view on her desk and she was not afraid to use it. Miss Giffin was always impeccably dressed with never a hair out of place. She looked as if she had just stepped out of the pages of Vanity Fair. Even now, almost fifty years later, I can close my eyes and picture her beautifully shaped and painted nails. Her coral lipstick was the final touch that tied everything together. Although I was in Grade five and as blind as a bat, I had advanced reading skills. At Language Arts time I joined the principal’s Grade Six class. I could hardly see past the end of my nose. Day after day, I told Mom I could not see the chalkboard, but she would not believe me. My mother was not famous for this. It is possible I had told one too many lies. Melda cannot see the chalkboard. You should take her to the eye doctor in Liverpool. I think his name is Mr. Wild. Thinking my scheme could not go wrong, I marched into the house and handed Mom the note. I had written it in pencil on a scrap piece of lined newsprint. I had done so much erasing, to make it look just right, that the paper had worn through in places. I don’t think I even used an envelope. The note looked anything but professional. It certainly was not the kind of note a teacher as particular as Miss Giffin would have written to a parent. That boo-boo could have given me away, but the universe was on my side. Mom wasn’t one bit skeptical. She had fallen for my brilliant scheme — hook, line and sinker, as they say. Eureka! Shazzam! Woohoot! Hooray! Yippee! Hallelujah! Bingo! Mom looked up Dr. Wile’s phone number right away. She booked an eye appointment for the next week with Dr. Wile, a Liverpool optometrist. He confirmed my story. I was as blind as I claimed — so blind I could not even read the big “E.” Dr. Wile scolded my parents for neglecting my eyesight. After the eye exam, I chose my first pair of glasses. There were so many choices; which ones would I pick? I was certain I had chosen the most beautiful glasses in the world. We returned to Dr. Wile’s office a week later to pick up my glamorous glasses. Mission accomplished. I spent the trip home from Liverpool reading aloud every word and number on every road sign. Shelburne 45 miles. Ferry Service from Yarmouth, Nova Scotia to Bar Harbour, Maine. Birthplace of Hank Snow. Welcome to Port Mouton. Do Not Litter. Maximum Speed 30 miles per hour. That should have been the end of the story, but it was not. My eleven-year-old problem-solving skills had not looked far enough ahead. I had not given any thought to what would happen if Mom discovered that I was the one behind the infamous note. Everything was hunky-dory until Mom decided to call Miss Giffin to express her appreciation. At the end of the conversation, Miss Giffin insisted there must be some confusion. She had not written the note. It must have come from Mrs. Verna Thomas, my reading teacher. Mom said thank you and hung up. She distinctly remembered that the note was signed Miss Giffin. It did not take long to put two and two together. Shaking in my boots, I admitted that I had indeed written the note. But only because she refused to believe that I needed glasses. For my Wedding: Huge Light Brown Glasses that had the arms/bows at the very bottom. And a bunch more between 1979 and today. To this day, glasses remain a big part of my life. I have regular bifocals, but I just cannot hold my head in the right position to read. I have added a pair of prescription reading and computer glasses with magnetic sunglasses. And that is not all. I also have prescription sunglasses. I need a big ole bag just to drag all of them around. And who knows? She could be right. Thank you for sharing this Melda. 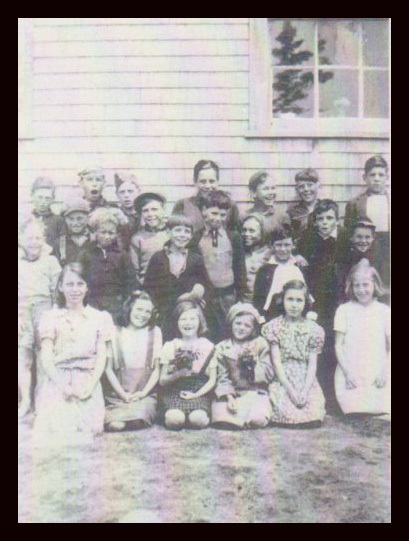 I enjoy your blog – but especially enjoy hearing about other peoples experiences at Ragged Island School. The school was such a huge part of my childhood where we lived close by. It was my playground, place to go when I needed a heart-to-heart with friends, and event centre with community baseball games when kids would come from as far away as WGH to play baseball. Thank you for adding another wonderful memory. It is an amazing revelation for blind children such as we were! Love your stories, Melda..brought back memories of Mrs Buchanan, one of my favourite teachers, and all the others who taught at the little West Head School..did you know that Uncle Ernie also taught there. Thanks, Claudia. I do recall Uncle Ernest talking about is days at the West Head School. I so enjoyed reading your blog Melda, brings back memories not only of glasses, but of clothing and uniforms in our school. Thanks, Patricia. Glasses kept getting bigger and bigger. They cover half of my face in my Teachers’ College graduation picture. They were also super thick and people called them coke bottom glasses.